Water Heater Leaking from Bottom: What do you do? Water Heater Leaking from Bottom: What do you do? If you find your water heater is leaking from the bottom, there's a good chance it's a serious problem. A pool of water underneath your water heater can often be one of the first signs you notice of trouble. This is a common place to find a leak and should be addressed as soon as possible. There are several issues that could cause your water heater to leak. A few are fixable. This article will help you identify the problem and give you step-by-step instructions on how to troubleshoot and resolve your leaking water heater. The temperature and pressure relief valve is designed to release pressure if the water gets too hot, or there's too much pressure inside the tank. The T&P valve is equipped with a discharge tube that runs from the valve to the floor. The tube is in place to make sure that any water that leaks from the valve is safely directed downwards, towards the floor, rather than spraying outwards and causing injuries. If you notice a puddle of water at the bottom of your hot water tank, check the bottom of the discharge tube for moisture. If you find water, the problem is most likely the temperature and pressure relief valve. The T&P valve is either faulty or there's too much pressure in the tank. This article will show you how to test the valve. If the issue is the T&P valve you'll typically be able to fix the problem by either replacing the valve or calling a plumber to deal with the internal pressure problem. 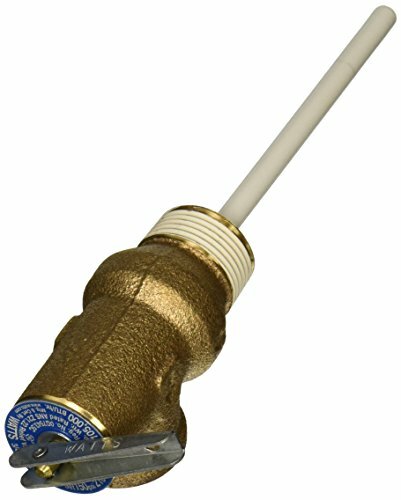 Since the T&P valve is a safety device on your water heater, you should fix this problem as soon as possible. Watch the video in step 3 to learn how to replace the Temperature and Pressure valve. Every water heater has a drain valve located at the bottom of the tank. 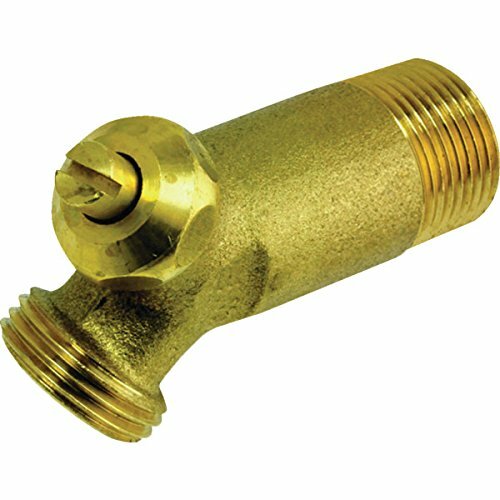 This valve is used to drain the tank of water in order to perform maintenance or to replace the water heater. The tank should be drained on a regular basis in order to remove the sediment which collects inside the internal tank. If the sediment isn't drained, it'll eventually cause damage to the inside of the tank. If the leak is coming from the nozzle, the drain valve may simply not be completely closed. Occasionally something will hit the handle on the drain valve and cause a small leak. Before assuming that the valve is faulty, first try tightening the knob by hand. If the nozzle continues to drip, the drain valve is faulty and will need to be replaced. Since this isn't a safety issue, you could screw a brass garden hose cap on to the end of the valve to stop the leak. This will buy you some time until you're able to swap it out with a new one. It's a good idea to purchase a water sensor alarm to alert you of any future leaks. Water sensors can save you a major headache, and for the price, they are an excellent investment. If you notice water seeping from the base of the valve, you'll need to replace the drain valve. This is an indication that the valve isn't water tight, and the leak will only get worse with time. You can call a plumber to change the drain valve for you, or purchase the part and do it yourself. Step 3 will show you how. The majority of leaks come from the hot water tank itself. If the tank is leaking, there's an internal problem that's causing water to slowly leak out and pool at the bottom of the tank. Usually, the root cause, is a build-up of sediment within the tank. When sediment isn't drained from the tank on a regular basis, it'll begin to cause the steel tank to crack and rust. Over time, a leak will eventually develop. A leak from the tank itself almost always means the water heater will need to be replaced. In this scenario, you can either contact a professional plumber to investigate further, or you can simply purchase a new water heater. If you think your leak is coming from somewhere else, check out our more extensive article to help you troubleshoot. Performing regular water heater maintenance will extend the life of your water heater. Flushing your water heater and checking the anode rod once a year will help prevent sediment build-up and add years of service life. Now that you've located the leak, the next step is to turn off the water and power to the water heater, this will help prevent further water damage. Electric Water Heater - Turn OFF the breaker for the water heater at the main electrical panel. Most water heaters use a 240 volt dedicated circuit breaker, which means that no other appliances will be on the same breaker. Gas Water Heater - Find the on/off dial, located on the side of the water heater near the bottom. Turn the dial to the OFF position. Find the lever or dial located on the water supply inlet. The water supply inlet is located at the top of your water heater. This is where the water enters the tank to be heated. To turn off the water supply, you simply turn the dial clockwise or turn the lever to the closed position (usually parallel to the pipe). This video will guide you thru troubleshooting your leak, as well as how to turn off your water heater. Depending on the location of your leak, and your comfort level, you may choose to do the repairs yourself. Or, you can contact a plumber to make the repairs for you. If the leak was originating from the temperature/pressure valve, or the drain valve, it's highly likely that your water heater can be repaired. It's important to keep in mind that water heaters have a life expectancy of up to 10 years, depending on the fuel source. If your water heater is nearing old age, or experiences any of these issues, regardless of the source of the leak, it may be more cost-effective to purchase a new one.